Kidderminster Harriers have announced that boss Gary Whild has agreed a 12-month rolling contract, while Ken Rae is to stay on as chairman of the Conference Premier club. Whild was initially put in charge until the end of the season after Andy Thorn was sacked in March. Rae has been acting as interim chairman since Mark Serrell left in February. Harriers face another season outside the Football League after narrowly missing out on a play-off place. In a statement, the Harriers board said it was now time to lay plans for the future. "It has been a difficult period for the club but I think everyone - from members of the board to players, management and most importantly, the supporters - have worked tremendously hard to bring some positivity back to Aggborough over recent weeks. The news that Gary Whild is to remain at Aggborough for the foreseeable future will be welcomed by the vast majority of Harriers fans as the club needs continuity going forward. 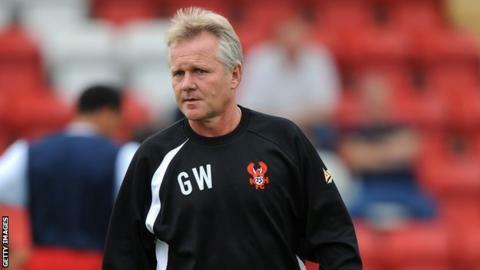 On top of this, a record of only one defeat in 12 games since he took over suggests the players are firmly behind him. They were ruled out of play-off contention in the penultimate game of the season so he deserves his chance to try to move the club on to the next level. The decision of Ken Rae to remain as chairman is also a boost as he and Whild worked together at Redditch United and know each other well. "The club is in a positive position both on and off the field after a challenging couple of months, and a lot of work from top to bottom has already gone in to planning for the future. We're very positive." So far, 2014 has been fairly tumultuous at Aggborough. Steve Burr was sacked as manager after nearly four years in charge and was quickly replaced by former Coventry City boss Thorn. Just over a month later, Serrell quit, citing online abuse he received about his running of the club as the reason, and was replaced by Rae. On the field, results under Thorn did not improve. Despite winning his first two matches and securing a lucrative FA Cup fourth-round tie at Premier League side Sunderland, Thorn was unable to steer the Harriers back into play-off contention and was fired after only 55 days in charge. Whild was then appointed with the task of getting the club into play-off contention in the remaining 13 games of the season. Despite only one defeat so far, the six draws Harriers picked up ultimately killed their chances.